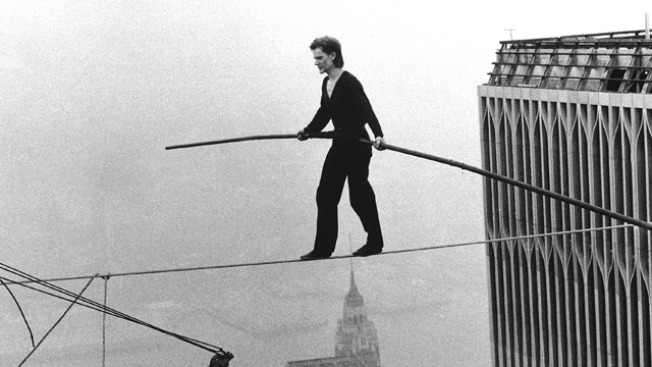 Philippe Petit -- the man whose 1974 tightrope walk between the Twin Towers was certifiably crazypants documented in James Marsh's award-winning Man on Wire -- is apparently hatching a plan for another high-wire stunt in our fair city. So what do you do once you've tackled not just the WTC but Notre Dame, the Sydney Harbour Bridge, and the Eiffel Tower? Apparently, you head to Midtown. And while Petit's Twin Towers trundle was illegal, the Frenchman doesn't need to skirt the law any more: Offers have been pouring in from official agencies all over the world.